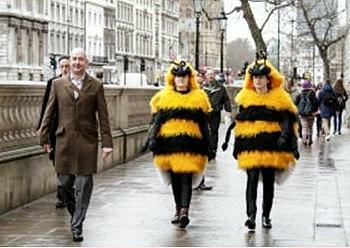 LONDON, UK, January 29, 2013 (ENS) – Giant bees appeared at Prime Minister David Cameron’s office at #10 Downing Street this morning to sting the government into delivering a Bee Action Plan, as part of Friends of the Earth’s Bee Cause campaign. The human-sized bees delivered over 64,000 demands from UK residents, gathered by Friends of the Earth and Garden Organic. The two advocacy groups ran parallel petitions asking for a National Bee Action Plan. Affected by disease, chemicals and habitat loss, UK bees have been dying off for several years and two bumblebee species are already extinct. Friends of the Earth is not the only group pressuring the government to halt the decline in bees. Eighty-nine Members of Parliament from across the political spectrum have called on the Prime Minister to introduce a Bee Action Plan, and 125 attended an event on January 15 to express their concern about falling bee numbers. 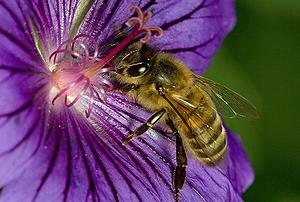 The Friends of the Earth bees asked the Prime Minister to make 2013 the Year of the Bee and agree an action plan that would include restoring habitat, helping farmers and gardeners to reduce pesticide use. 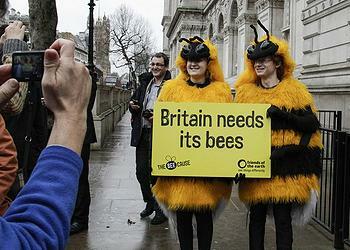 The bee demonstrators asked the government to protect all 267 British bee species, not only the ones that make honey. Today’s demonstration also coincides with the government’s Advisory Committee on Pesticides discussion on neonicotinoid pesticides, believed to be a contributing factor to bee decline. “One in three mouthfuls of the food we eat is dependent on pollination at a time when a crisis is threatening the world’s honey bees,” says the British Beekeepers Association. There are estimated to be up to 44,000 beekeepers in the UK; 99 percent of them are amateurs. On January 10, the UK government published a consultation seeking views from amateur beekeepers and commercial bee farmers on how the government can best support improving honey bee health. In the consultation, the UK Department for Environment, Food and Rural Affairs, together with the Welsh Government, outlined proposals which will help beekeepers to identify and manage pests such as the Varroa mite, considered the single greatest problem for beekeepers. “But these bees are susceptible to pests and diseases and need to be cared for properly to aid their long-term survival, which is why we’re consulting on new measures to help beekeepers and improve bee health,” he said. The consultation will run through March 9. Defra will receive public comments at this link: http://bit.ly/TL1UlK. The government is offering improved guidance for bee keepers from the National Bee Unit as well as a new enhanced rolling training program run by the NBU and beekeeping associations for all beekeepers. Advice on beekeeping can be found on the NBU’s BeeBase website www.nationalbeeunit.com. The website also contains details on how to join BeeBase, a free database which links apiarists with other nearby beekeepers to help track pests and disease and provides guidance on how to tackle them. On January 16, the European Food Safety Authority published three reports, as requested by the European Commission, to assess risks associated with the use of the neonicotinoid insecticides clothianidin, imidacloprid and thiamethoxam as seed treatment or as granules. The EFSA concluded that acceptable use of these pesticides is only for crops not attractive to honey bees due to the risk of exposure from pollen and nectar. A risk to honey bees from exposure to dust containing these chemicals either was shown or could not be excluded. Guttation is the exudation of drops of xylem sap on the tips or edges of leaves of plants such as grasses. Guttation is not the same as dew, which condenses from the atmosphere onto the plant surface. The assessments identified data gaps that the EFSA said made it impossible to finalize them. Now the EFSA reports will be considered by the European Commission, which will decide whether there needs to be a proposal to change regulation of these substances at the European Union level. The do-it-yourself retailer Wickes says it will replace a product containing thiamethoxam later this year.